We make three Handgun Holster sizes to fit most all handguns, the small 4 ½ inch Handgun Holster fits most snub nose revolvers, most small and mid sized automatics, Walther PPK, small and medium Kahrs and Kel-Tec, small and mid sized Glocks, HKP7M8 and 2000SK, Sig 239 etc., basically most handguns, automatics and revolvers, up to 6 ½ inches in length. The medium 6 inch Handgun Holster fits most handguns, revolvers and automatics, up to 8 inches in length and is the most versatile of our Holsters fitting mid sized and some small and large handguns equally well. Our large 8 inch Handgun Holster fits most revolvers and automatics up to 10 inches in length such as full size 1911, HK USP Tactical threaded barrel .45 automatic and Smith and Wesson large frame Model 29 six inch barrel, six shot .44 Magnum revolver. 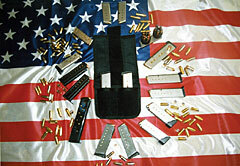 Our Handgun Holsters are tough as nails and built to last a lifetime out of Industrial Heavy Duty nylon webbing and HDPE plastic, the plastic they line pickup beds with, it will not scratch or mar your handgun, protects your handgun from sweat, and will speed up your draw and last forever as it lines the inside of our holsters and keeps the holster open at the top for re-holstering. 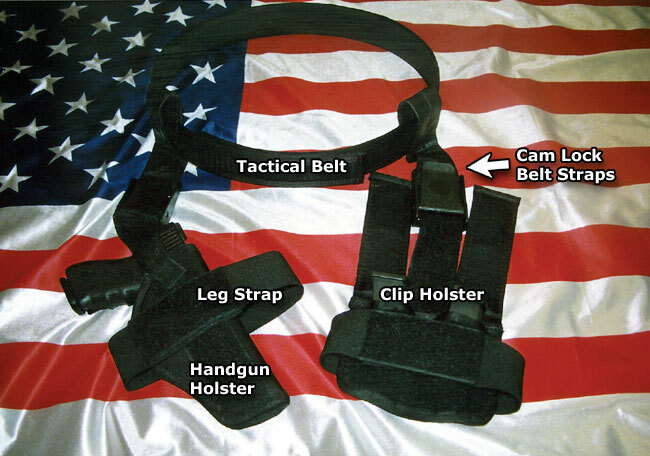 A BARGAIN AT ONLY $30 PER HOLSTER AND COMES WITH A BELT STRAP AND LEG STRAP! Our Small Magazine Holster holds two and fits all single stack and double stack magazines from two Walther PPK .380 single stack clips to two 13 shot .45 ACP double stack magazines or even two 33 round 9mm Glock magazines. 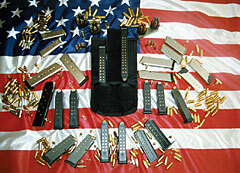 It will also hold and fit two to four .38/.357 Magnum five shot revolver speed-loaders. 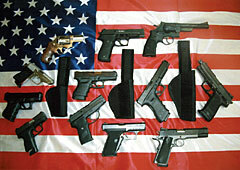 Or you can load it up with a Tactical Folding Knife such as the Spyderco and a Tactical Flashlight such as the Surefire. 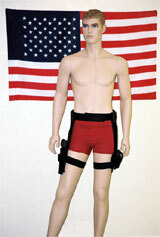 The Small Magazine Holster is what most people should order, unless they order two handgun holsters for each leg. The Large Magazine Holster should only be ordered if you are going to carry revolver speed-loaders bigger than the five shot .38/.357 Magnum speed-loaders, such as six to eight shot .38/.357 speed-loaders or moon clips or .45 ACP or .45 Colt or .44 Magnum speed-loaders or moon clips. Our Magazine Holsters are made out of Commercial Heavy Duty nylon webbing and lined inside with HDPE plastic, the same plastic they line pick up truck beds with. 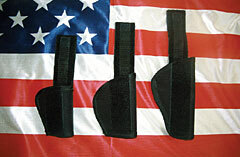 Our Magazine Holsters are tough as nails and built to last a lifetime, the HDPE plastic liners protect your magazines from sweat and help to hold the magazines secure in the holster, the plastic will not scratch or mar your handgun magazines. A BARGAIN AT ONLY $30 PER Magazine HOLSTER! Comes with Belt Strap and Leg Strap. 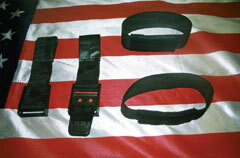 I recommend the tactical belt, it is very high quality made with a HDPE plastic liner with soft velcro on the inside and hook velcro on the outside and will not crumble or bend under load and you can wear it concealed under your clothing with the concealed tactical gun holster system, or on the outside of your clothing as a regular tactical gun holster system, we have three sizes of tactical belts, the small tactical belt fits all waists up to 35 inches, the medium tactical belt fitd waists 36 inches to 45 inches, the large tactical belt fits 46 inches to 55 inches, a bargain at $15. 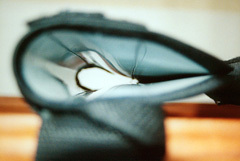 Widths: 2 in. or 1 1/2 in. 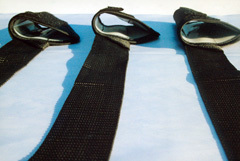 Our tactical leg straps are made from industrial strength elastic and velcro. Our tactical belt straps are made from industrial strength nylon webbing and feature a cam lock buckle for easy adjustment. 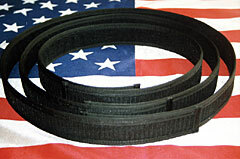 Only $10.00 for each belt or leg strap. Not needed unless want extra or lose one.